Let's take a look at setting up a contact form and capturing that data back into CIviCRM. Prerequisites: You need to have CiviCRM and Gravity Forms both installed on your site first; then also download and install the CiviCRM Gravity Forms Add-on. Once these are loaded and activated, we can begin. 2. 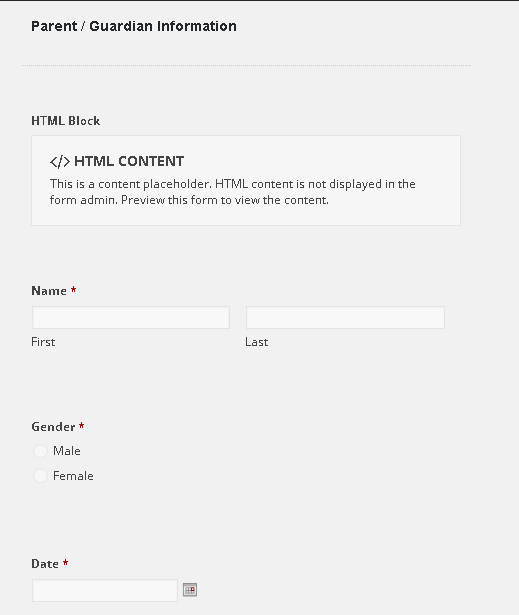 For this example, I want to set up a multi-page form that includes information for a parent and for their child. This is pretty cool to be able to sync multiple groups of data simultaneously from a single form. a. Choose the fields you want to include on the parent page first. b. Then choose the Page field and select the fields you want to include for page 2. 3. Title your fields and tweak them to fit your needs. 4. Save / Update your form and Preview it to verify it's the way you want it. 5. And now you're ready to set up the feeds that bring the data into your CRM. You'll be able to set up both Contact feeds and Activity feeds.